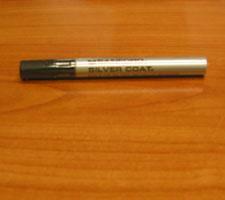 Silver Thick Paint Pen by Uni-Paint | Sports Memorabilia! Silver Thick Paint Pen by Sanford/Uni-Paint. This silver pen is the standard for the industry for autographing on brown football panels. It is also great for paper material such as posters. These pens are also frequently used for full size helmets too!